McVeigh is scheduled to be executed on May 16. 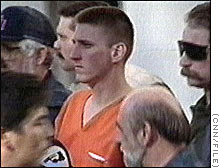 DENVER, Colorado (CNN) -- An informal agreement by a coroner not to conduct an autopsy on Oklahoma City bomber Timothy McVeigh apparently will stand after a federal judge ruled Monday he had no jurisdiction. McVeigh's attorneys asked U.S. District Judge Richard Matsch to approve an informal agreement under which the Vigo County, Indiana, Coroner Susan Amos agreed not to conduct any "invasive procedure" on McVeigh following his execution. Documents in PDF format require Adobe Acrobat Reader for viewing. After listening to presentations from McVeigh's attorneys, prosecutors and the Vigo County attorney, Matsch said he had no objection to the plan but had no jurisdiction. "My jurisdiction ends when Timothy McVeigh ends," said Matsch, who presided over McVeigh's case on a change of venue from Oklahoma. Under the agreement, on the day of his execution McVeigh will disrobe for a visual examination through a window of his death row cell for any signs of physical abuse. The coroner has said autopsy results could be used to defend lawsuits filed by death-row inmates who allege mistreatment or abuse. McVeigh also agreed to sign a statement that he has not been abused in custody. If he refuses to sign it or claims he was abused, an autopsy will be performed. The coroner will examine the body again after McVeigh's execution, taking photographs and X-rays if necessary. If Amos finds evidence of abuse, she could then perform an autopsy if McVeigh's attorney approves. McVeigh, 32, an Army veteran of the Gulf War, ended all appeals of his death sentence in December, but said he opposed "the planned mutilation of my corpse." McVeigh attorney Rob Nigh told reporters before court convened Monday that McVeigh opposed an autopsy for ethical and philosophical reasons. After Matsch ruled he had no jurisdiction, Nigh said McVeigh would not take the issue to another court. Federal officials told CNN that they have no rules set up to cover autopsies because the last federal execution was a hanging in 1963. "We don't have any protocol on this," said one official. Vigo County attorney Timothy Fears said that under Indiana law a county coroner may conduct an autopsy in the case of an "unnatural death" -- including an execution -- but does not have to. He argued the federal court should honor the coroner's discretion under state law. McVeigh's other attorney, Nathan Chambers, told CNN there is no standard for autopsy in federal executions because the last federal execution occurred 38 years ago. "This is new territory," Chambers said. The issue is complicated, he said, because federal rules say autopsy is to be handled in accordance with the law where the sentence was imposed. The sentence was imposed in Colorado, but it will be carried out in Indiana. "Even more complex is the question as to what extent a local coroner has jurisdiction on federal property," Chambers said, adding that there is no federal coroner. McVeigh was convicted of murder, conspiracy and weapons-related charges in the April 19, 1995, bombing of the Alfred P. Murrah Federal Building in Oklahoma City.